Gold is an enigma. Certainly, gold has practical applications. It conducts electricity, does not tarnish, can be drawn into wire and hammered into thin sheets. However, it is the perceived value of the metal that drives the price. Additionally, there is a "finite" amount of gold available at any given point in time. You cannot take your gold seeds, plant them in the spring and plan for the autumn harvest. If you have mined the metal, you have it on hand. The straightforward laws of supply and demand will be a key factor in dictating price. The world's appetite for the precious metal has strengthened. According to figures obtained by BizVibe, global gold production surged from just 1,518 metric tons in 1917 to 3,169 tons in 2016. Meanwhile, global gold demand was estimated at $127 billion in 2016. China has been the largest gold-producing country in the world since 2006. Today, China accounts for over 15 percent of global gold production. Australia is the world's second-largest producer of gold with 270 metric tons of gold produced in 2016. Russia is in third with a total gold output of 250 metric tons in the same year. With a relatively static supply and growing demand, what are the main factors that drive the price of gold? Interest rates have a big influence on gold prices because of opportunity cost. With interest rates holding near their historical lows, bonds and CDs are, in some cases, yielding nominal returns that are less than the national inflation rate. This leads to nominal gains but real money losses. In this instance, gold becomes an attractive investment opportunity despite its 0 percent yield because the opportunity cost of forgoing interest-based assets is low. The same can be said of rising interest rates, which boost interest-bearing asset yields and push opportunity costs higher. In other words, investors would more likely forgo gold as lending rates rise since they'd be netting a higher guaranteed return. Another driver of gold prices is U.S economic data. Economic data, such as the jobs reports, wage data, manufacturing data, and broader-based data such as GDP growth, influence the Federal Reserve's monetary policy decisions, which can, in turn, affect gold prices. That brings us to supply and demand economics. As with any good or service, increased demand with constrained or low supply has a tendency to pull prices of that good or service higher. Conversely, an oversupply of a good or service with stagnant or weak demand can push prices lower. According to the World Gold Council, gold demand during 2018 grew 4 percent from 2017 to 4,345 tons, with investment demand down 7 percent. 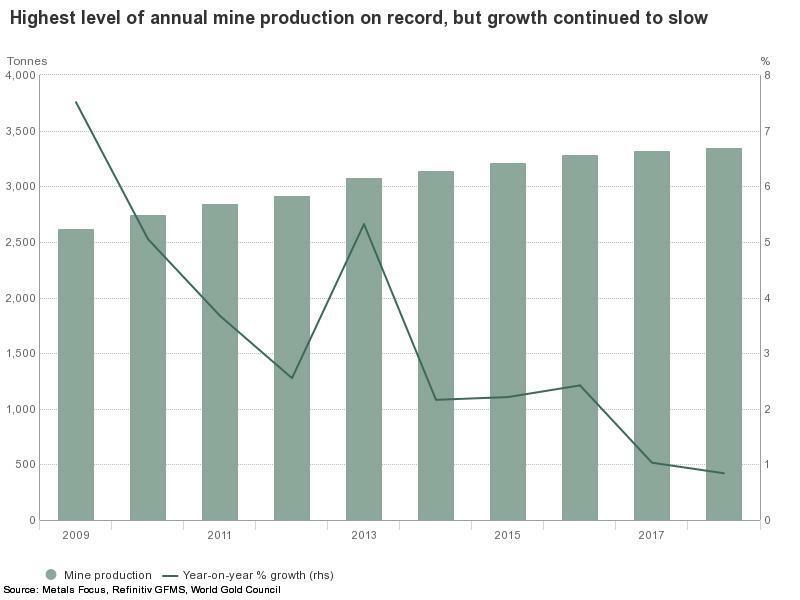 However, gold supply only increased by 1 percent in 2018, which represents the slowest rate of supply growth since 2008. Growing demand and constrained supply have been a reason gold prices have headed higher since mid-August 2018. It's true that gold is a commodity, but since it is also a way to transfer and preserve wealth, there are unique currency effects that drive the price of gold. Since internationally traded gold is denominated in U.S. dollars, as the dollar strengthens, the price of gold tends to go down. The opposite is also true. A weaker dollar usually moves the price of gold goes up because, by default, other currencies will strengthen. To define it in other terms, when the U.S. dollar starts to lose its value, investors look for alternative investment sources to store value and gold is an alternative for those investors. Gold is influenced by supply. The world's top gold mining companies each make more than $3 billion in annual revenue, and total gold mined in 2018 reached 3,347 metric tons. More gold is out there, and finding it is big business. But with a finite amount of gold available for consumption at a given time, traditional supply and demand economics play less of a role with gold prices than with commodities like, say, corn or crude oil -- one of which can be grown, the other which is discovered, refined and consumed by billions of people daily. With gold, interest rates, currency moves and economic data are the primary factors to watch. Learn more about trading tools and resources for gold futures.